Imagine opening an old book whose spine has broken due to frequent use. As you turn the pages, you realize that small cards and notes have covered many of them. Photographs even cover some. Each new page added includes the signature, or signatures, of Masons encountered by the collector. Rough estimates number the collection at around 400 autographs. The collection is the result of the work of Dad Gustav E. Venaas, an Advisor from St. Paul Chapter in Minnesota and dates from the 1920s to 1950 when Dad Venaas died. According to an inscription at the back of the book, presumed to have been added by Dad Venaas, he joined St. Paul Lodge No. 3, receiving his Master Mason's Degree on October 14, 1927. An undated newspaper clipping contained in the book includes an interview of Dad Venaas, who described the beginning of the collection as "an accident." He went on to state that "One evening...as I was leaving a lodge meeting with a copy of "Masonry Defined," it occurred to me that it might be interesting to have some of the members of my lodge sign it." While an exhaustive review of all of the autographs has not been completed, there are only two known signatures of non-Masons, President Herbert Hoover and former heavyweight boxing champion James J. Corbett. Among the many Masonic autographs are future US President Calvin Coolidge, over 30 governors, several senators, leading military figures, and Masonic dignitaries. The signature of a third US President, then-governor Franklin D. Roosevelt seems to have been requested but not obtained as indicated by the page bearing his photograph and a place to paste the signature when received. Specific examples include General of the Armies John J. Pershing, Secretary of State Frank B. Kellogg, polar explorer Admiral Richard E. Byrd, composers John Philip Sousa and Erving Berlin, and retail magnates J.C. Penney and Charles R. Walgreen. 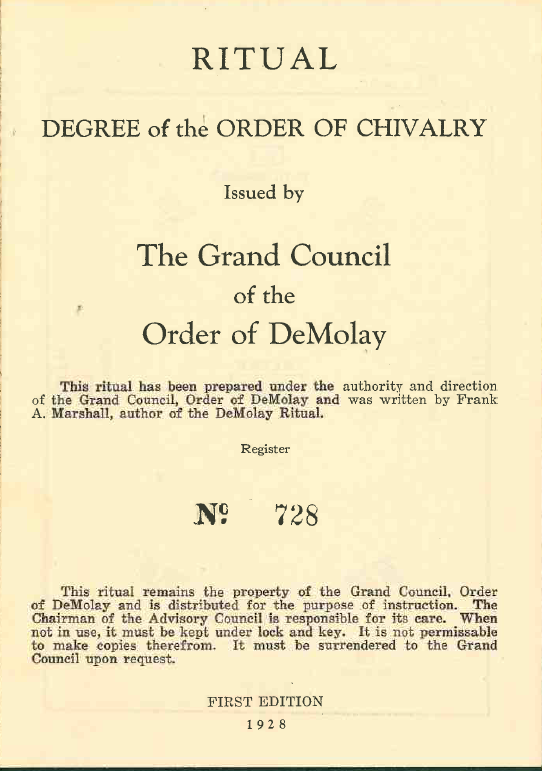 How did this book come into the possession of DeMolay? While we don't know specifically, it is logical to presume that it was part of a more extensive collection of items sent from St. Paul Chapter. One of the first scrapbooks from the Chapter is also in the museum collection in Kansas City. It is interesting to note, however, that Dad Venaas stated to the newspaper in St. Paul that once the collection began the book only left his hands on two occasions. The first was to obtain the signature of the Sovereign Grand Commander of the Scottish Rite Supreme Council in Washington, D.C., after which it was sent to Kansas City, which is presumably when the signatures of Frank S. Land, Frank Marshall, Louis Lower, Grand Master John Glazier, and several members of the Grand Council were added. Would you like to receive more stories like this every month? Join The 1919 Club or login to your account if you’re already a member. 25% of your contribution will directly support the Jurisdiction of your choice. 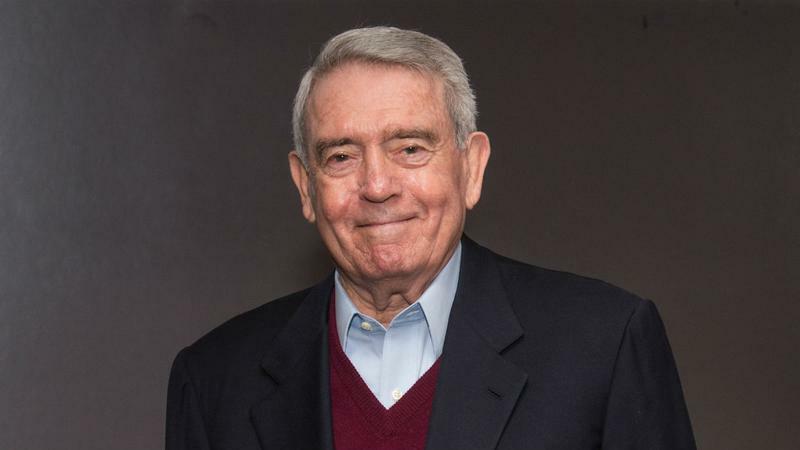 Dan Rather, iconic newsman, was born on October 31, 1931 in rural Wharton County, Texas. His family relocated to Houston when he was a child, and it was there that he joined DeMolay while in high school. After graduating from Sam Houston State University in just three years, Rather briefly attended law school before beginning a career in journalism. A chance trip to Dallas in November 1963 to return tape to a local news station placed Rather just across the highway from the famed “grassy knoll” on Dealey Plaza during the assassination of President John F. Kennedy. Rather’s autobiography states that he didn’t witness or hear the shooting, but did witness the panic in the area immediately following. Rather’s reporting during the time immediately following Kennedy’s death brought him to the attention of CBS management and led to his selection as White House Correspondent in 1964. He also served as a foreign correspondent in London and Vietnam before returning to the White House press pool during the Nixon administration. In this role, he accompanied President (and DeMolay Foundation Trustee) Richard Nixon on the first trip of a sitting US President to China. He also covered the Watergate scandal and subsequent impeachment hearings before being named anchor of the CBS Sunday Night News and later the CBS Saturday Evening News. In 1975, he became a contributor to 60 Minutes. His success there helped him become the leading candidate to replace fellow Senior DeMolay Walter Cronkite as anchor of the CBS Evening News in March 1981, a decision that Cronkite strongly disagreed with. While never stated directly, the rivalry between their DeMolay Chapters in Houston may have played a part in the disagreement. Come back next month for more speaking notes of Dad Lands, spotlights on Senior DeMolays who have done remarkable things, and fascinating pieces of DeMolay history!